Earlier in the year I entered a sci-fi short story competition hosted by the National Space Centre in collaboration with Literary Leicester Festival, and I found out a few weeks ago that I’d been chosen as the runner up in the 16+ category! I’ll be presented with my prize, and read a short excerpt from my story, on the 18th November (and hopefully will be able to post some pics) but until then if you’d like to read my story it’s free to read on the National Space Centre website so just follow the link HERE and enjoy! I’ve recently had a story published in the anthology Use Enough Gun, which is available to buy in both paperback and Kindle format from Amazon via the following link. Monster hunting tales are as old as mankind, and the popular Legends of the Monster Hunter series has offered some of the best monster hunting tales ever told! 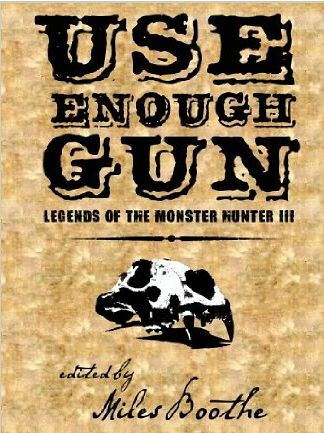 Use Enough Gun is the third in this series and brings an exciting edge to the collection by exploring what happens when monster hunting goes wrong! Stalk vampires, werewolves and other creatures of legend…but do not expect the hunter to always triumph. Sometimes they miss their target, and sometimes their target gets them! The wooden walls surrounding him shook and shuddered like a coffin hoisted onto pallbearers’ shoulders. Nigel was used to it. For over thirty years he’d ridden the paternoster to and from his office on the twelfth floor. Today was the last time though. He clutched a potted peace lily to his chest. The oversized retirement card he’d somehow wedged into his briefcase. There was a moment of darkness as the car passed between floors, but then he saw the ninth floor landing. Sociology. A student was stood waiting. He wore jeans that looked like they were about to fall down around his ankles, a t-shirt with an offensive logo, and the vacant look in his eyes that so many of his contemporaries shared. The look that each year Nigel had felt slightly less inclined to want to change, until he hit the point when he knew it was time to go. For a moment it looked like the teenager was going to step onto the carriage as it dropped past, his body tensed as if he hadn’t noticed someone was already there. Technically there was room for two, but etiquette leaned away from stepping onto an already occupied car. And then he finally noticed Nigel, rocked back on his heels and decided to wait for the next one. The paternoster rumbled on, and in a moment he was gone. The eighth floor was devoid of life. This belonged to Psychology, though there were a few cramped offices reserved for sociology professors the department were trying to encourage out. It was when he saw the sign for Media Studies on the seventh floor when he realised that this was it, that his academic life was over. When he’d first come here there’d been no such thing as Media Studies, and the seventh floor had accommodated Drama. But as in all things the old eventually gave way to the new. A history professor knew that best of all. Drama gave way to Media Studies, and he would give way to young (she was only 50!) Rosemary Butters. Only the paternoster defied replacement. To remove it would cost a small fortune, and to replace it with an actual lift would be almost impossible, so even if it was removed it would leave a gaping wound in the heart of the university, one that would never heal. He had no such illusions about his own passing, he would be a small cut on the University’s flesh, nothing more, one that would pain it, but one that would heal quickly, and wouldn’t even leave a scar. Sometimes he thought the mechanical heart of the paternoster would go on driving it, even if the world were to end. Ironic that such an old fashioned contraption defied oncoming technology. The building did have a lift as well, but it was a tiny affair that was only ever used when the paternoster was out of action (a rare occurrence) and even then it usually broke down soon after because of overuse by the queues of staff and students that quickly built up. There were the stairs of course, but nobody used them for more than a couple of floors, unless they were on a New Year health kick. There was a sharp jar as the car reached the third floor; Theology’s territory. The jar was nothing to worry about, just an early warning, a gentle reminder to ensure people looked up and saw the sign advising (in bold red letters) that they MUST get off at the ground floor, and that continuing to ride the car as it dipped into the bowels of the building before sweeping around to come back up the other side was STRICTLY FORBIDDEN! Not that this stopped people, and by all accounts it was still a rite of passage for most freshers. Nigel had never done it. Oh he’d stayed on and ridden over the top, but that wasn’t prohibited. The signs didn’t tell you not to do it; they just advised you to keep still and not move around too much. It’d been a little unnerving the first time, like a fairground ghost train. Fear embraced you along with the darkness, because you couldn’t quite shake the feeling that some low obstacle would take your head off. Subsequent journeys had been dull, pointless, and he’d quickly tired of the experience. But in more than thirty years he’d never ridden the paternoster all the way down, under the building and back up the other side. As the ground floor began to appear time seemed to slow, just a glimpse at first through the gap created at the bottom of the car, growing bigger as the car descended. Soon enough it reached the event horizon, the moment where it was first safe to step off. Nigel didn’t move. He watched as the floor of the paternoster and the ground floor met, a moment of equilibrium before they parted once more, acquaintances who briefly became lovers, then went back to merely being friends again. Even as the ground floor moved upwards there was still time to step out of the car. Nigel clutched the plant closer to his chest and gripped the handle of his briefcase a little bit tighter. Darkness, but this time it didn’t pass as the open car moved to another floor, this time it enveloped him like the sea claiming a drowning man, one who’d been chained to an anchor because he continued to drop, and this surprised him, he thought the car would only descend the depth of another floor, but it seemed much further. He was considering pulling the emergency cord—it would be embarrassing but it wasn’t like he’d have to see these people again after today—but before he could put his briefcase down the car stopped dead with a jolt. A heartbeat later and it started to move to the left. It was noisier down here in the darkness. The rattle and thump of the mechanism no longer shielded by distance or concrete, now the beating of the paternoster’s heart was impossible to ignore. Each beat was long drawn out groan, like an asthmatic pensioner drawing his final few breaths, and each time Nigel imagined that this would be the last one. But on and on it went. The darkness and noise were cloying, and so were the smells. The scent of dirt and oil, of layer upon layer of grease, and he imagined the cogs and axles of the engine that drove the device must be coated in the stuff, like arteries clogged with accumulations of cholesterol. He detected other smells beneath the grease, the whiff of something rotten, as if an animal had died down here, the odour of a backed up toilet. And despite the clunking beating of the mechanical heart he heard the creak of the wood around him, straining as if under pressure, and the skittering of tiny feet, rats he guessed, though he couldn’t shake the sudden notion of skeletal fingers rapping against a wall. He’d shrunk into himself, lowering his head into his shoulders in case something in the gloom was going to snag him. He knew it was unlikely given how many people had taken this trip, but still fear of the unknown gripped him. The noise and the darkness didn’t help, and neither did the slowness of the journey. He’d imagined it would just take a few seconds, a minute at most, but it seemed like he’d been down here for much, much longer. The stench was getting worse. He kept his mouth shut, not wanting to breathe any of the foulness in, but he couldn’t shake the feeling that his pores were absorbing the stink, and his skin prickled at the thought. His heart had begun to pound, and again he considered pulling the emergency cord. Except to do that he would need to reach up, reach into the void, and he couldn’t shake the feeling that, if he did, his fingertips would make contact with something that wasn’t supposed to be down here, wasn’t supposed to be anywhere. And then a red light flared in the darkness, a rose blooming and dying in the darkness. He jumped when he saw it, and felt a tiny stab of pain in his chest that made him clutch the flowerpot even tighter. When it winked again he was less taken by surprise, but his unease wasn’t going away. He tried to tell himself that the light looked closer purely because he was moving towards it. When it flashed again it was much brighter, and as it faded he was sure he saw something in the wan vermillion afterglow, spindly limbs clinging to the wall. Pipes, he told himself, just pipes, but he dreaded the next flare of light. And then there was another jolt as the car stopped once more, then began to ascend, and he let out a slightly embarrassed sigh of relief as the machine noise started to recede. He could still hear skittering below, could still see the blinking red light, though now it was below him, now it illuminated nothing. The car seemed to be struggling to rise, and he backed up against the carriage wall, annoyed at his skittishness yet somehow convinced that in the darkness below him something clung to the bottom of the car, something that was even now clambering over the edge. A creak of wood made him whimper. And then light, bright, wince inducing light as the car reached the ground floor, his head emerging as if that drowning man had escaped his shackles and had broken the surface once more. There was no hesitation this time, no hint of nostalgia or of missed opportunity. As soon as he was able to he stepped up and out of the car. It was an awkward, ungainly manoeuvre, and he almost stumbled, almost fell face first onto the floor, but he just had to get out of the wooden box. Even once he was clear he didn’t look back, he couldn’t shake the feeling that he might see scratch marks scored deep into the wooden floor of the car he’d occupied. He felt somehow infected. He could still smell the paternoster on himself, permeating his clothing, and now he just wanted to get home, to shower and change. He gave a shudder and walked away from the paternoster, not favouring it with a final glance. The paternoster didn’t care. It rumbled on behind him. Here’s another little story of mine from a couple of years ago, which is still available (along with many other fine tales) on the 365Tomorrows website. Frankly it was the sort of ad you see in the papers every week, and you always laugh at the idiots who reply. At least I used to, but the recession was pinching, and my redundancy pay was running out. I was desperate. The interview was laughable. Just a bland guy called Tony asking me inane questions in a hotel room, followed by him waving what looked like a calculator in my face. ‘Yeah but hired for what?’ I asked, suspicious that I was about to be asked to strip. Desperate or not, this was the point when I stood up, flipped him the finger, and headed for the exit. Before I could reach for the doorknob however, it vanished…along with the door. Suddenly I was facing a counter, an old cash register welded to it by rust; empty shelves lined the back wall, cobwebs everywhere. Turning I discovered I was in an abandoned shop. The windows had been badly boarded up- and sunlight streamed in through myriad gaps. I wasn’t alone. ‘Welcome to 1978,’ said Tony. After trial and error though, Tony discovered that time has nothing against hard labour, and nothing against putting your earnings in a high interest account then drawing the proceeds out in the future. However it only works with money earned in the past (trust a woman to be that fickle). So Tony hops back, gets a job as a labourer for a week or two, banks his wages and skips forward to live off the interest. So now I have a new job. I’ve been a street sweeper in 1970, a navvy laying railway lines in 1925, heck I even helped build the Titanic. I never have to work more than a week, then I return to the instant after I left to discover I’m a wealthy man. Of course Tony takes half, but so what… I’ve worked just a month in the last year, and earned well over a hundred thousand.